En Solitaire is a creative work that has been created in response to a film that is considered by many to be a masterpiece of early experimental animation. 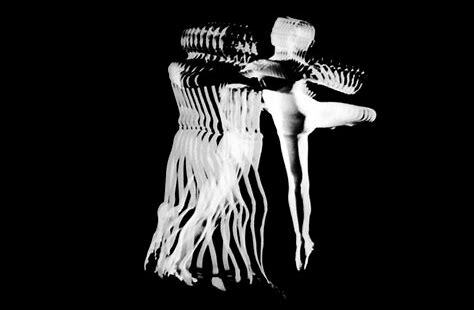 Pas de Deux created in 1968 by Canadian filmmaker Norman McLaren is a technically complex, yet visually powerful exploration of time and movement. This film encapsulates the driving concerns McLaren’s animation practice, his vast body of work results from a prolific career (spanning nearly 40 years and more than 30 films) as an innovative experimental filmmaker. His methodologies and outcomes not only shaped the world of experimental film and animation but spoke to his audiences on a deep level. (Collins,1976). Pas de Deux (meaning “dance for two” or “duet”) featuring multilayered, shimmering visual representations of two dancers in a constant flux of movement is “…an extraordinary success on three levels – aesthetic, sensual and intellectual.” (National Film Board of Canada, 1971-72). In approaching the creation of my short experimental study of solo movement I have dissected Pas de Deux using my own observations and have referred to numerous reviews of the work as well as McLaren’s own technical notes and interviews. I have used this analysis to identify key elements as starting points for my exploration. These elements also became guides in my decision-making process and influenced the various methodologies that unfolded throughout my creative process. Still images from Pas de Deux by Norman McLaren (1968). captured movement just passed and movement yet to come in a most aesthetically pleasing flow of shimmering motion” (Elliot, 1971, p. 44). The bodies themselves at times begin to transform into ‘winged’ or multi-limbed forms. It appears as though time has been slowed down, and as a result, the viewer is able to gain a different knowledge or understanding of time and movement. Early chronophotographs of photographer Étiene Jules-Marey. McLaren states; “Movies move! How it moves is as important as what moves.” (McLaren, National Film Board of Canada, 2006, p. 16) This can certainly be identified as a key aspect of Pas de Deux. As a viewer I became fascinated not only by the form and shape of the body, but more interestingly, the way in which the bodies progressed through their chain of movements. In other words, McLaren found a way to accentuate and illuminate, not just the dancers’ movement, but also their movement pathways. As a young man Norman McLaren was interested in painting however when he discovered the film medium he found that "Not only could his film-paintings have those dimensions of duration and movement which are missing from static art, but also they could move through space, which McLaren found extremely kinetic". (Elliot, 1971). I am interested in the idea that as viewers of film and live theatre we experience different sensations than can be experienced in everyday life. In describing his films in general; “The McLaren films have a marvelous relation to a kinesthetic experience, like dance, a marvelous sense of duration, plus a kind of muscular thing where they speak to your muscles almost directly through the eye and not the head” (National Film Board of Canada, 2006, p. 16). The short film I have created, En Solitaire (meaning ‘Solo’) has been influenced by the concepts of time and movement explored in relation to McLaren’s creative process. I have used the video editing program Adobe Final Cut Pro to organise my footage in a computer based non-destructive editing environment. McLaren used film stock, a much more labor-intensive task; however the processes employed to create the effect are essentially the same. Within the linear sequence I layered up to eleven layers of the duplicate moving images on top of one another (see screen shot below), each one slightly offset in relation to the next, to achieve the effect. At times I varied the intervals (as did McLaren), to achieve a variety of effects. I also varied the number of duplicate layers. I noticed that the spacing of the intervals did not necessarily dictate the clarity in the movement pathways. For example, the smaller the interval, the more obvious the 'trail' of bodies and limbs through the space, however larger intervals could also achieve an interesting effect when applied to the right movement. Careful selection of the choreography was important. Which sections to 'animate', according to their inherent qualities of speed, duration and spatial direction became significant decisions. After doing a couple of tests I also came to understand which movements were more successful than others. In creating the choreography I generally found that simple clean movements worked best, as did movements that focused on the full range of motion of the limbs and torso. A screen shot from the En Solitaire Adobe Final Cut Pro project. Whilst informed by McLarens’ technical process to achieve the effects that he created in Pas de Deux, I also wanted to capture some of the inherent qualities of the film. Rather than aiming to replicate his ideas I wanted to use them as stimulus for my film. Using the idea that the body could move into and out of itself, appearing to move forward and backwards ‘through time’ I was able to shift and abstract the body, it’s physicality and it’s identity from being something purely physical into something more metaphysical or transcendent. This information also influenced my use of a black and white/ sepia tones and also the use of shadow. There were no shadows in McLaren’s film but here in my solo experiment I chose to accentuate the dark shadowy quality, suggesting an ambiguity between the body and it’s shadow – at times the shadow disappearing completely as I leant against the wall. Music also plays a big role in enhancing the qualities of the work. McLaren was heavily influenced by music. When asked what stimulated and encouraged him, he said “I listened to music a lot of the time and forms suggested themselves in motion to me just naturally while listening to the music”. (McWilliams, 1969). I chose the accompanying piece of music by electronic composer ‘Murcof’ because I felt it matched the fractured, tonal and temporal qualities of the imagery, and suggested a sense of space and movement. There is no doubt McLaren pushed the boundaries of animation. His personal definition of animation states: “Animation is not the art of drawings that move but the art of movements that are drawn; What happens between each frame is much more important than what exists on each frame; Animation is therefore the art of manipulating the invisible interstices that lie between the frames.” (Furniss, 1998, p. 5). With this in mind I have created a short film that has used some of the key questions that emerged from my analysis of McLaren’s animation practice and in particular the driving concerns of his film Pas de Deux, and I have used them as stimulus for my exploration. Bukatman, S. (2006). Comics and the Critique of Chronophotography, or ‘He Never Knew When It Was Coming!’ London, Sage Publications. Collins, M. (1976). Norman McLaren. Ottawa, Ont: Canadian Film Institute. Elliott, L. (1971). Norman McLaren: The Gentle Genius of The Screen. Reader's Digest, (1971). Furniss, M. (1998). Art in motion: Animation aesthetics. Sydney: John Libbey. Laybourne, K. (1979). The animation book: A complete guide to animated filmmaking: From flip-books to sound cartoons. New York: Crown Publishers. Mc Williams, D. (1969). Talking to a great film artist - Norman McLaren. McGill Reporter, 1(35). National Film Board of Canada (2003). Norman McLaren: On The Creative Process. [Video/DVD] Harrington Park, NJ: Milestone Film and Video. National Film Board of Canada, (1971-72). Film Catalogue. Russett, R. and Starr, C. (1976). Experimental animation: An illustrated anthology. New York: Van Nostrand Reinhold Co.